V.F. Corporation VFC posted strong third-quarter fiscal 2019 results, wherein both the top and bottom lines surpassed the Zacks Consensus Estimate and improved year over year. With this, the company delivered its sixth bottom-line beat in the last seven quarters. Results were mainly driven by gains from robust trends at its core brands (Vans and The North Face). The company also witnessed solid growth at its international and direct-to-consumer businesses as well as strength across most of its segments. As a result, management raised its outlook for fiscal 2019. Following the robust fiscal third-quarter results and upbeat outlook for the fiscal year, shares of the company increased 9.9% during pre-market trading. However, the stock has lost 15.9% in the past three months, wider than the industry’s 8.4% decline. The company’s adjusted earnings per share of $1.31 from continuing operations improved 30% year over year, exceeding the Zacks Consensus Estimate of $1.09. Earnings included 1 percentage point contribution from acquisitions, net of divestitures. On a constant-dollar basis, adjusted earnings rose 31%. V.F. Corp generated net revenues of $3,940.2 million, which increased about 8% year over year and surpassed the Zacks Consensus Estimate of $3,874 million. Constant-dollar revenues jumped 10%. Excluding the impact of acquisitions net of divestitures, revenues improved 7% and 9% at constant currency. Revenue growth can be attributed to continued strength in the company’s largest brands, international and direct-to-customer businesses along with robust Active, Outdoor and Work segments. Adjusted gross margin rose 60 basis points (bps) year over year to 52.2% backed by favorable mix-shift toward high-margin businesses. Adjusted operating income rose 30% to $656 million and adjusted operating margin expanded 270 bps to 16.6%. Notably, adjusted operating income included a $7-million contribution from acquisitions net of divestitures. Excluding acquisitions net of divestitures, adjusted operating margin rose 280 bps to 16.8%. Revenues at the Active segment grew 16% to $1,142.6 million (up 18% on a constant-dollar basis). The improvement was driven by a 25% (27% in constant dollars) increase in revenues for the Vans brand. The Outdoor segment reported revenues of $1,612.6 million, which improved 11% year over year (up 12% in constant dollars). 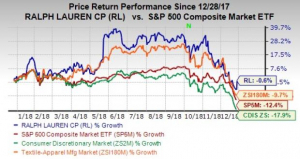 The segment’s revenues benefited from a 14% rise (up 16% in constant dollars) in The North Face brand as well as a 4 percentage point contribution from acquisitions. Revenues at the Work segment rose 2% and 3% at constant currency, to roughly $493.6 million. The Jeans segment reported revenues of $657.9 million, reflecting a decrease of 5% year over year (and 3% on a constant-dollar basis). Other revenues rose 1% to $33.5 million on both reported and constant-dollar basis. V.F. Corp ended the fiscal third quarter with cash and cash equivalents of $535.3 million, long-term debt of $2,135.2 million and shareholders’ equity of $4,300.6 million. In the first nine months (ended Dec 29, 2018), the company generated cash from operating activities of $1,436.7 million. Further, management announced a quarterly dividend of 51 cents per share, which is payable Mar 18, 2019, to its shareholders of record as of Mar 8. As of the quarter-end, the company had $3.8 billion remaining under its existing share repurchase authorization. Following robust fiscal third-quarter results, the company raised its earnings and sales view for fiscal 2019. V.F. Corp now expects revenues to be a minimum of $13.8 billion, which represents a 12% and 13% growth at constant currency. Earlier, the company anticipated revenues of at least $13.7 billion, up 11% from the year-ago period. On a segmental basis, the company expects revenue growth of 8% for Outdoor, 16% for Active, 39% for Work segments. However, it projects revenues to dip 3% at its Jeans division. At its International business, V.F. Corp expects revenues to grow 10-11% and 13% at constant currency. Revenues for the direct-to-consumer business are expected to increase 13% and 14% at a constant-dollar basis. The company still estimates digital revenue growth of above 30%. While adjusted gross margin is still anticipated to be about 51%, adjusted operating margin is now expected to expand 90 bps to 13.6% versus prior guidance of 80-bps increase to 13.5%. Management now envisions adjusted earnings per share of $3.73, mirroring growth of 19% year over year and 20% at constant currency. Markedly, this guidance includes an additional $45 million or 9 cents per share from incremental investment. Earlier, it projected adjusted earnings per share of $3.65. Further, V.F. Corp still expects cash flow from operations to be approximately $1.8 billion in fiscal 2019. The effective tax rate is expected to be 16%. Moreover, capital expenditures are estimated to be roughly $275 million for the fiscal year. V.F. Corp currently carries a Zacks Rank #3 (Hold). Crocs, Inc. CROX outpaced the earnings estimates in each of the trailing four quarters by an average surprise of 126.3%. Also, the company sports a Zacks Rank #1 (Strong Buy). You can see the complete list of today’s Zacks #1 Rank stocks here. 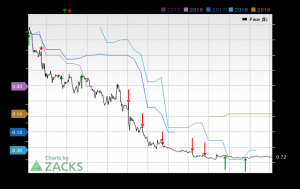 Cherokee Inc. CHKE is also a Zacks Ranked #1 stock, which has an expected long-term earnings growth rate of 15%. 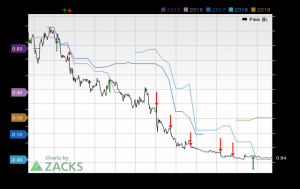 lululemon athletica inc. LULU presently carries a Zacks Rank #2 (Buy). It has an impressive long-term earnings growth rate of 19.3%.